The Japanese Space Agency mission Hayabusa 2 has been traveling through the solar system for well over three years, chasing down a dark rock called Ryugu. And now, after all that time and distance, it's just 240 kilometers from its target. Ryugu is roughly 900 meters across (about a half mile), and orbits the Sun on an elliptical path that takes it from just outside the orbit of Mars to just inside that of Earth. That classifies it as a near-Earth asteroid, though there's no chance of impact for centuries. But that does make it an object of interest… and it's a rare type of asteroid that's rich in carbon, and likely relatively unchanged for billions of years. So it's an object of much interest. Oh my. Those images have been smoothed a bit, but show quite a few noteworthy things. Ryugu takes about 7.5 hours to rotate once, and it does so backwards (that is, it spins the opposite way the Earth and most other planets do). That in itself isn't surprising; it's likely suffered an impact or two that could have changed its orientation (or itself was the product of an impact from a larger body). You can easily see craters on its surface, too. Jason Davis of The Planetary Society has more about its rotation. I'm very interested in the shape. It's pointy, which again in itself isn't surprising. It's small, so it has very weak gravity, and can't form itself into a sphere. But the images above have been rotated to put Ryugu's north pole pointing up, which means it's wider at the equator than through the poles. Moreover, there's what looks like a ridge running around its equator… if I had to speculate I'd guess that this is due to material sliding to that location due to its rotation. The centrifugal force from the spin would apply a nudge to any loose material, causing it to roll "downhill," to a location where the forces balance better: the equator. We may find out if that's right very soon. Hayabusa 2 is planned to get within just 20 km of Ryugu over the next few weeks, where it will set up shop (so mind you, the images it takes will be more than 10 times better than what you see above). It has cameras onboard to image the surface and also will deploy a lander called MASCOT that is so clever it makes me smile. It's a rectangular box less than a third of a meter across and has a mass of 10 kilograms. On the surface of Ryugu, though, that mass translates to it weighing about as much as a big drop of water on Earth! It has an offset weight in it that, when moved, will use its torque to launch the lander on a series of shallow hops so that it can move around the surface! Whoa. It also has two other rovers called MINERVA-II which use a similar method to move around the surface. But there's more: the spacecraft will deploy an impactor that will slam a 2.5 kilo piece of copper into the surface at 2 km/sec. This will dig down into the asteroid, revealing material underneath, which can then be analyzed to understand Ryugu's interior. Copper is used because asteroids don't contain copper, and so that can be distinguished from native materials. 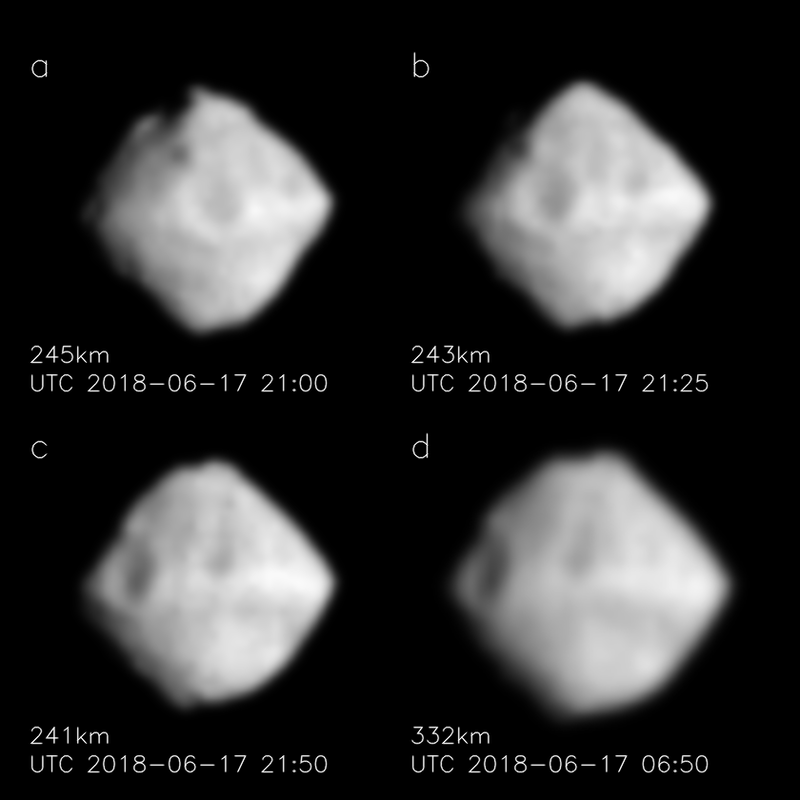 Even more exciting, the crater carved by the impact (probably just a few meters across) will be a targeted landing site, so Hayabusa 2 can collect samples of the asteroid and return them to Earth! The spacecraft should swing by our fair planet in 2020, where it will deploy a Return Capsule with the samples. The flying-saucer-shaped capsule will use our atmosphere to slow down like a meteor, then land in Australia using a parachute, where it will be picked up by scientists so they can study the asteroid samples in the lab. Incredible. The details on the equipment onboard Hayabusa 2 are fascinating, and I suggest you read the Spaceflight 101 page on it. As usual with solar system missions, my friend Emily Lakdawalla has loads of info too. You can follow her on Twitter for updates, and the mission itself has a Twitter feed, as well. Also, JAXA has a very nice page about the mission translated into English. I'm really excited about this! We've only seen a few asteroids up close, and even fewer missions were more than flybys. We're about to learn so much about another — if tiny — world in our solar system! This is what exploration is all about.